What do ackee, cassava, cycad, lychee, potatoes, red kidney beans, starfruit and sugar cane have in common? While that question may sound like the opening line of an offbeat joke, the health-related similarity these fruits and vegetables share is no laughing matter. Plants, like animals, employ various strategies to ensure their survival, and naturally occurring toxins help some plants resist disease and insects. 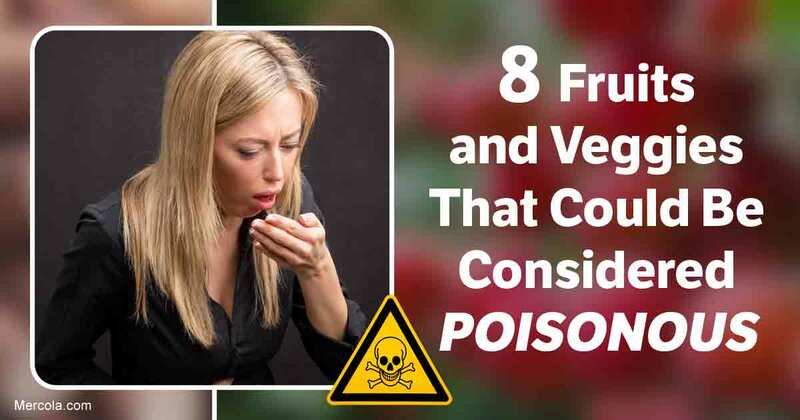 While you may think everything in nature is suitable for human consumption, each one of the fruits and vegetables mentioned above contains small amounts of toxins that may harm your health when ingested at certain times or in large amounts. As reported by CNN,1 there are important considerations you must keep in mind should any of these “natural-born killers” appear on your grocery list. Nonetheless, ackee endures as the national fruit of Jamaica, even taking its place alongside saltfish as part of the country’s national meal. Given its mild flavor and buttery, creamy texture, ackee is usually treated as a vegetable in cooking, as opposed to a fruit. It is used in many savory dishes because it pairs well with other vegetables, meat and fish. According to CNN,5 cassava, also known as yucca, follows closely behind corn and rice as the most important calorie source in Africa, South America and parts of Asia. Some 600 to 800 million people worldwide are believed to consume cassava daily. Cassava is most commonly baked, boiled or fried, releasing a gummy, starchy texture. It can also be ground into flour. Organic cassava is a primary ingredient in my cocoa-cassava gourmet snack bars, one of my favorite occasional treats. Processed under rigorous health and safety standards, the organic cassava used in my snack bars adds a hint of sweetness and moisture, as well as calcium. Of the two main types of cassava — sweet and bitter — bitter contains the most concentration of a cyanide-inducing compound called cyanogenic glycosides, more than 50 milligrams per kilogram. Hydrogen cyanide is released from the cyanogenic glycosides through chewing when it is mixed with enzymes, resulting in the release of hydrogen cyanide. Whereas the sweet variety only requires boiling to reduce its potential cyanide content to non-toxic levels, the bitter root contains more toxins and therefore requires both soaking and cooking prior to consumption. The video below, produced by a Kenyan news station, highlights the negative effects of ingesting unprocessed cassava. Cycad sago is a starch extracted from the stems of ancient, highly toxic palm-like plants that grow in tropical regions around the world. Sago is used for both food and medicine but, like cassava, requires extensive processing to be safe for human consumption. Sago pearls, which are similar in appearance to pearled starches such as potato or tapioca, can be boiled with sugar and water or milk to make a sweet pudding. “This is an ancient plant, but is one of the most toxic plants on the planet,” Spencer noted. “It’s strongly implicated in the induction of neurodegenerative disease.”10 For example, consumption of cycad seeds may play a role in Guam disease, a neurological disease similar to Alzheimer’s and Parkinson’s common to the island of Guam, where the plant originates. The process of detoxifying cycads varies by region, but generally involves aging, cooking, fermentation and washing. Regardless of the method, two known neurotoxins, BMAA (B-methylamino-L-alanine) and cycasin, must be removed before any part of the cycad plant can be safely eaten. Despite its spiky exterior, when enjoyed at its peak, lychee fruit can be smooth, juicy and beautifully sweet. Unfortunately, this tasty exotic fruit, also known as litchi, can be toxic and sometimes fatal when eaten before it is ripe. Malnourished children are at particularly high risk for serious illness and death from lychee poisoning. A report13 published in The Lancet Global Health medical journal claims the devastating disease is very likely caused by lychee. One of the study authors, Dr. Padmini Srikantiah, neurologist and lead investigator in Muzaffarpur on behalf of the U.S. Centers for Disease Control and Prevention office in New Delhi, suggests toxins from unripe lychee can cause extremely low blood sugar. “[T]o the best of our knowledge, this is the first comprehensive confirmation that this recurring outbreak of acute encephalopathy is associated with both hypoglycin A and MCPG (methylene cyclopropyl glycine) toxicity from [lychee] consumption. This illness is also associated with absence of an evening meal. While potatoes originated in South America, they are cultivated worldwide today, taking their place as the world’s fourth largest crop. Despite boasting more than 100 varieties, the majority of potatoes sold and consumed are in the form of greasy French fries or potato chips. Processed potato products contain trans fat and very often chemical additives and other processed ingredients that contribute to chronic health conditions such as cancer, heart disease and obesity. According to Medline Plus,14 while most potatoes are safe for consumption, you should definitely avoid eating potatoes that are green in color or those that have sprouted, unless you have removed the sprouts. This is due to the likely presence of a toxin called solanine, which develops with exposure to light. For this reason, always store potatoes in a cool, dark place, but never in the refrigerator. If you eat too many toxic potatoes, you may experience vomiting, stomach and abdominal pain, hallucinations and even paralysis. Signs of solanine toxicity include a bitter taste or burning sensation. If you think you are at risk of poisoning, call your local poison-control center. In the U.S., the national toll-free number for the American Association of Poison Control Centers is 1-800-222-1222. While not immediately life-threatening, consuming fried potatoes also puts you at risk for a cancer-causing and potentially neurotoxic chemical called acrylamide. Acrylamide is the byproduct of a chemical reaction between sugars and the amino acid asparagine at temperatures above 250 degrees F (120 degrees C). Carbohydrate-rich foods such as French fries and potato chips, which are heated to very high levels to produce a browned or charred surface, are likely to contain high amounts of acrylamide. The toxin phytohemagglutinin is common in many varieties of beans, but concentrations are especially high in raw, red kidney beans. Fortunately, by cooking red kidney beans you can reduce the toxicity level sufficiently for them to be safely eaten. The U.S. Food and Drug Administration (FDA)15 states eating as few as four or five raw beans may cause symptoms, which generally develop within one to three hours. Onset of phytohemagglutinin toxicity is often marked by extreme nausea, followed by vomiting (potentially severe) and diarrhea a few hours later. Some sufferers also report abdominal pain. Recovery is generally quick — within three or four hours after symptoms begin. While somewhat less toxic, white kidney beans, also known as cannellini beans, also should be cooked thoroughly before eating. Cannellini beans contain about one-third of the toxicity of red kidney beans when consumed raw. Starfruit, so named for its shape when cut, originated in Asia but is now grown in warm climates around the world. It is used as an herbal remedy for a range of ailments, such as coughs, headaches, parasite infections and vomiting. Starfruit boasts a yellow-greenish skin, and its taste ranges from bitter to sweet. The sweet type is known to have thicker flesh. While generally safe for most consumers, starfruit contains a neurotoxin your body will not be able to safely process if you suffer from kidney disease, says the U.S. National Kidney Foundation.17 Symptoms of starfruit poisoning include hiccups, mental confusion, seizures and sometimes death. A 2015 study18 suggests individuals with healthy kidneys should take care to not overconsume starfruit given the possibility of developing kidney problems due to excessive or prolonged consumption. As such, I recommend you eat starfruit only occasionally. Given my beliefs about the negative effects of sugar on your body, as well as the addictive nature of sugar, I would never recommend eating raw sugar cane. Another reason you should avoid consuming raw sugar cane relates to the presence of a common fungus that develops when the cane is stored for several months. Sugar cane has been noted as one of the top 10 mycotoxic foods, as outlined in the book “Mold: The War Within,” by Kurt and Lee Ann Billings. In simplest terms, mycotoxins are fungal poisons. The Billings present many natural treatments for mold toxicity, which may be of interest if you have a sensitivity to mold. The best way to avoid ingesting plant toxins is to be aware of what you are eating and informed about any potential toxins in your food. This article touched on a handful of fruits and vegetables — clearly there are countless other food items that may be of concern to you personally. It’s worth your time and your health to become educated. In particular, you should take action if you believe something you’ve eaten once, or eat on a regular basis, may be having a negative effect on your body and sense of well-being. This is a good opportunity for me to remind you that it will be impossible to achieve optimal health unless you eat foods that nourish and support your body. If you have not yet had a chance to check out my Nutrition Plan, consider doing so today.